(Left) PH booth prominently dispalyed top PH destinations; (Top R) Undersecretary Bengzon joins panel and discusses PH tourism priorities; (Bottom R) Members of the PH delegation from DOT and DFA led by Secretary Wanda Teo pose for photo. The Philippines participated in the recently concluded World Routes 2017, held on 23-26 September 2017 at the Fira Gran Via, L’Hospitalet, Barcelona. The PH booth, located in the central part of the exhibition space, highlighted PH’s most popular destinations and included a stand for dried mangoes and DOT notepads as souvenirs. There was also a bar with a Filipino bartender who performed “flair bartending” to attract guests to the booth. The Philippine delegation was composed of public and private sector officials from the tourism, aviation and airport authorities and was led by Department of Tourism Secretary Wanda T. Teo, who expressed appreciation to the organizers for choosing Cebu as the host for Routes Asia 2019. The Routes organization is a private business focused on aviation route development and the company’s portfolio includes events, media and online businesses. The company organizes and operates world-renowned airline and airport networking events through its regional and World Route Development Forums. More than 200 airline carriers, 700 airports, 130 tourism authorities from 110 countries participated in the event. PH officials met with their counterparts and airline executives to discuss the possibility of more routes opening to Manila, Clark and Cebu in the near future. One of the highlights of the event were panel discussions on various relevant topics on the future of tourism and aviation development. DOT Undersecretary Benito Bengzon was a panelist on the Keynote Panel Discussion on the topic, “Will 2020 be a Tipping Point for Tourism.” Usec. Bengzon noted that for PH, 2020 is not yet the tipping point but could be considered the “turning point” as between now until 2020, about (5) international gateways will be completed. These projects are expected to improve air connectivity from major tourist source markets to the Philippines. These projects are: Mactan Cebu International Airport, Puerto Princesa International Airport, Panglao Island International Airport, Clark International Airport, and San Vicente International Airport in Palawan. In May 2017 PH opened for operation the Puerto Princesa International Airport, which will be the vital link between international tourists and the island of Palawan. Furthermore, through President Duterte’s Build, Build, Build program, about fourteen other projects are envisioned to spur tourism growth in the Philippines. The panel also touched on “over tourism,” which was more of a concern for other panelists. Highly popular tourist destinations, such as Barcelona, are concerned about tourist saturation in certain areas. However, PH’s challenge at the moment is ensuring that tourism’s economic benefits are inclusive and trickle down to all aspects of society. The issue with limiting tourists to avoid saturation, when quantified, could translate to several families losing their livelihood. PH will host Routes Asia 2019 in Cebu. 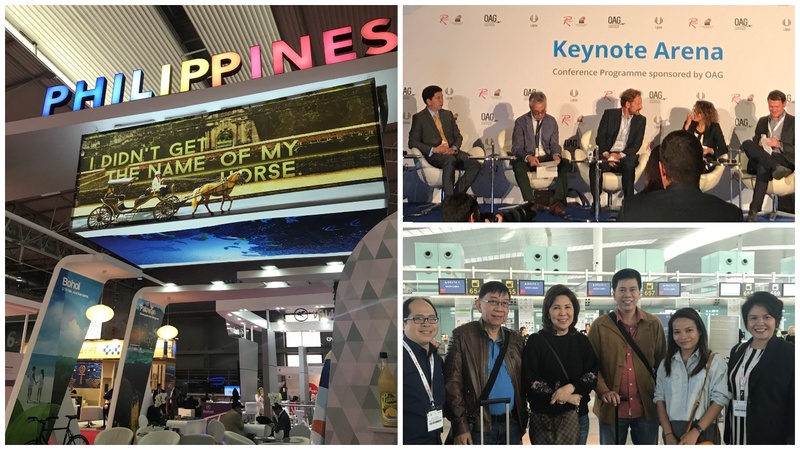 PH previously hosted Routes Asia 2016, where more than 1,200 local and international delegates representing airline carriers, airport executives, tourism authorities and aviation data providers participated in the event. PH submitted its bid for the event and was awarded the hosting by Routes Asia’s Future Hosting Unit. Routes Asia 2019, considered one of the most expensive aviation event in the world, is expected to attract senior decision makers from the region’s air service development community and provide a platform to expand connections and discuss route development opportunities. PH was nominated for the Best in Destination Marketing award category, along with Canary Islands Tourist Board, Madrid Destino, Malta Tourism Authority, Tenerife Tourism Corporation, and Tourism Ireland. Although Tenerife Tourism Corporation won, PH was the only non-European tourism authority to be nominated.